Present a stunning coffee table book for use in retail sales, promotions, rewards and as distinctive in-room gifts for group events. Provide a thoroughly researched and compelling historical record for the benefit of the owners, staff, guests, and partners you serve. Capture the unique stories of the hotel, its founding, its preservation, and the people and community who have helped it become such an important landmark. Create a database of original, high-resolution digital imagery for the hotel’s use, including the architecture, grounds, interiors, staff, culinary offerings, and other amenities, activities and traditions. 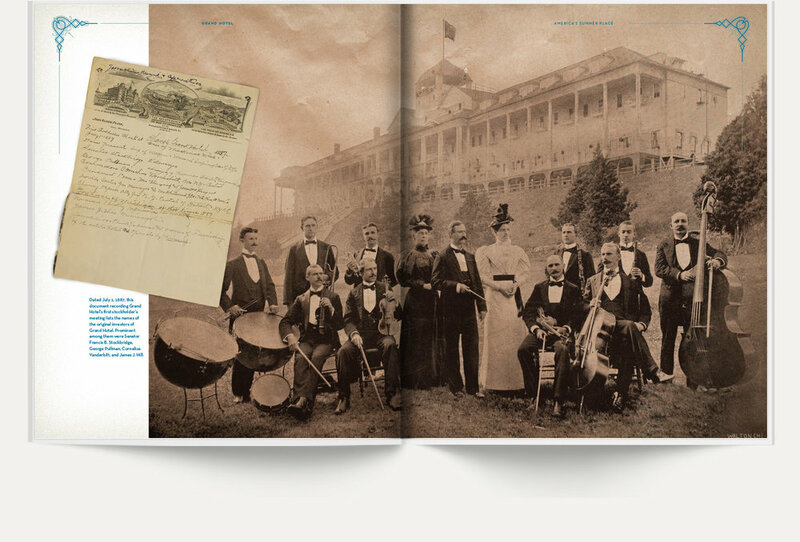 Grand Hotel at Mackinac Island, Michigan celebrated its 125th Anniversary in 2012 by commissioning Grandin Hood to publish a commemorative coffee table book to mark the milestone event. It continues to be among the most popular mementos the Hotel sells today. From the initial order of 10,000 books, 1,000 were designated to be enhanced as “Special Edition” copies, signed by the Grand Hotel’s longtime and venerated owner. The signed books were offered as part of the 125th Anniversary package, which filled quickly. Additionally, during that first and the following six-month season, enough copies were sold to exceed their full investment. Over the course of six subsequent years, the book has enjoyed continued success as a VIP amenity gift and generated a handsome profit through brisk sales. Historic Hotels of America is dedicated to sharing the stories and preserving the legacy of each of our member hotels for future generations, and there is no finer publishing partner than Grandin Hood. We look forward to building the Historic Hotels of America® Collection, and adding to Grandin Hood’s impressive portfolio. We believe this is important work for our organization, but also a product that has been proven to deliver significant return on investment for member hotels. Founded in 1994 by Pulitzer Prize-winning photographer Robin Hood, Grandin Hood Publishers has established a national reputation for producing award-winning projects for hotels and resorts around the country. Grandin Hood books are not dry compendiums of historic chronology; instead, they are inspiring presentations of the traditions, locations and people that are an organization’s image. Regardless of the size of the historic hotel, or the focus of your story, Grandin Hood will bring that story to life in a visually engaging and memorable edition to be treasured by recipients for years to come. Success! A member of our organization will contact you shortly to discuss your interest in the Historic Hotels of America® Collection and Grandin Hood Publishers. *Books produced and distributed by Grandin Hood on behalf of independent historic hotels inducted into Historic Hotels of America®, an official program of the National Trust for Historic Preservation. The copyright © for the name, Historic Hotels of America Collection, is owned by Historic Hotels of America and the National Trust for Historic Preservation. 2018. All Rights Reserved.